BETHNAL GREEN is now a 'thing'. We performed the world premieres of our new play at Brighton Fringe on 13th and 14th May 2017 to large houses. Feedback thus far seems to be very positive. 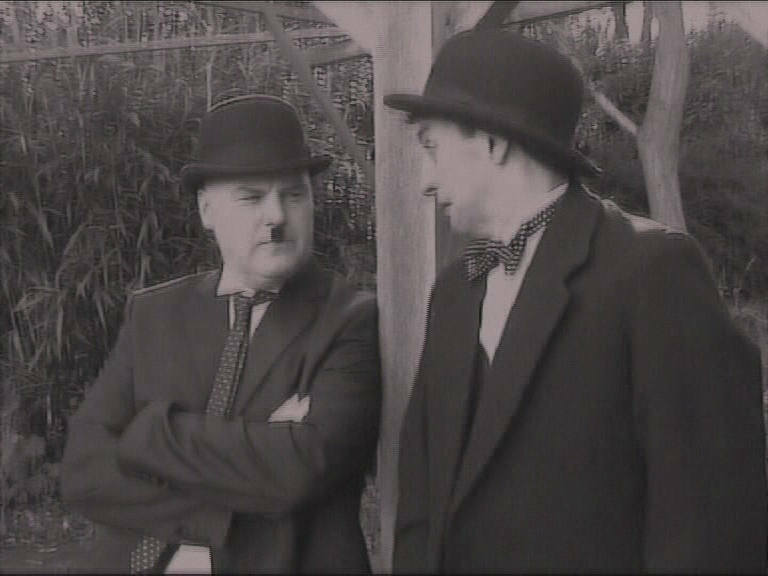 It's certainly a huge dramatic difference to the style of HATS OFF TO LAUREL AND HARDY. We'll be touring this show to Guildford Fringe, Buxton Fringe and Ludlow Fringe later this year, along with special performances at St John's Church in Bethnal Green, right next to the staircase where the disaster happened, when the Memorial is finally dedicated later in 2017. Here's a screen grab from video shot on Sunday 14th May. ​NO NEWS UPDATES FOR ABOUT THREE YEARS?! There has been so much going on in the world of Lucky Dog recently! A well-attended show at The Place Theatre in Bedford, sell-out shows during a residency at The Alma in Bristol, the opening performance of the first Wokingham Fringe Festival and four hugely popular shows at Brighton Fringe (and we ended up on GOOD MORNING BRITAIN on ITV on May 13th which you can see HERE). Two of them were sold out, and two insisted on encores. 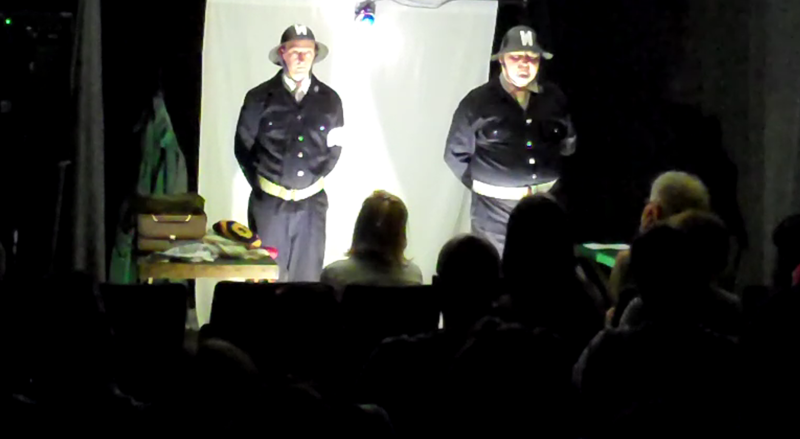 That's not to mention the full standing ovation we received performing HATS OFF TO LAUREL AND HARDY at the 35th Sons Of The Desert Convention in Manchester (and the subsequent promotional video for the play, which you'll find elsewhere on the site). We currently have another six five-star reviews (and a four-star) for the Brighton run. The next show is due to be at The Laurel And Hardy Museum in Ulverston on 14th June, then off to Hollywood for a performance on the 5th July, then back for two shows at Reading Fringe, Guildford Fringe (plus a performance of 'Jack The Ripper: Facts, No Fiction'), two shows at The Pavilion in Matlock Bath and a lot of new bookings appearing (including the main Sweet venue at Edinburgh Fringe, and a double-nighter in Manchester as well as potential bookings for several Sons Of The Desert tents, Belfast, St Albans and Guildford). You'll find a written interview HERE and a podcast interview HERE. Here's some video diaries from our trips out this year, which are getting less and less to do with the show and more and more to do with Lucky and insulting each other. We now have a very busy summer ahead of us with a lot of festivals and theatre bookings all over England, but we particularly wanted to share our large role as part of 'Another Fine Fest' in Ulverston on June 14th - a major celebration of Stan Laurel's birthday. Some newcomer by the name of Paul Merton is performing as well and we're hoping he'll be catching our performance. 'Hats Off To Laurel & Hardy' will be performed in the Laurel & Hardy Museum and entry will be free. Details about the event can be found HERE and you might want to check out the video below we shot to help publicise and fund-raise for the festival. We've known about this for some time, but we've been waiting on permission to go public. At the end of June, we're flying out to Hollywood! 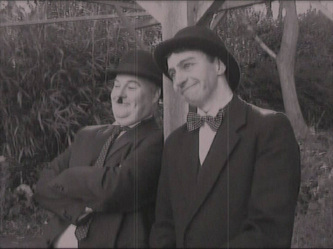 We've been booked to perform 'Hats Off To Laurel & Hardy' at Laurel & Hardywood in Los Angeles. Stan's daughter, Lois, will probably be watching. We're als0 going to 'be' Stan and Ollie for much of the convention and will be visiting a lot of their filming locations and their final resting places. Needless to say, we never thought in our wildest dreams things would get to this stage and we're so grateful to leading Son Of The Desert, Del Kempster, for waving our flag to convention organiser Bob Satterfield. 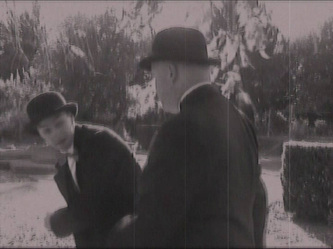 We are well into performances of 'Hats Off To Laurel And Hardy' now. We already have dates at Bestival (Isle of Wight), Riverhouse Barn (Surrey), Heron Theatre (Cumbria), Seagull Theatre (Suffolk) and The Laurel And Hardy Museum (Cumbria) under our belts to rave reviews and the bookings continue to pour in for 2014. Here's a few videos from our time on the road. THE NEW SHOW - ALREADY UNDERWAY! The new full-length play, 'Hats Off To Laurel & Hardy' (which has been self-penned with advice and help from leading Laurel & Hardy expert Dean McKeown) is already in rehearsal! You can expect a play that is accurate and covers their whole lives. Lots of recreations of scenes from their films (live and on-screen - and sometimes both) and some more singing and dancing to be expected. We have three national dates booked up to October, but there will be plenty more to come (half a dozen to confirm and one already booked for early 2014). Look on our new 'Dates' tab to see where we are and how to book. 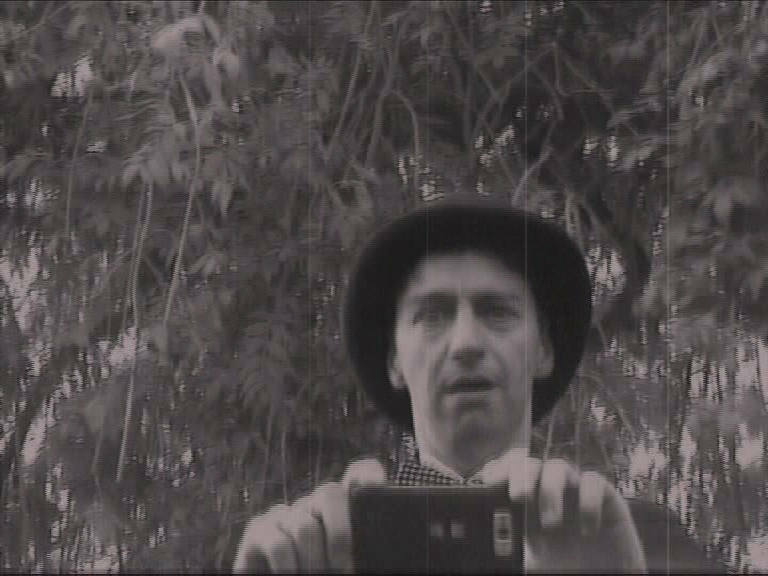 With thanks to Ross K Foad of 'No Place Like Holmes' fame, below we're proud to present a video we've had put together of our dance from 'Way Out West', which you'll see in the show. We've also secured our spot at Brighton Fringe City - we'll be previewing sections from the show at about 12:30pm on Saturday 11th May! There's been an awful lot going on in the world of the Dog. The videos for the show have been completed, the adverts for them are online, all the media have been contacted for the Brighton run (and we have some quite important reviewers coming to see it, much to our excitement/fear), we've now rehearsed with our third member, Kelsey, and things are way ahead of the game. The next move is to get those venues booked for the autumn tour... of which more exciting news when the time is right! BRIGHTON TICKETS NOW ON SALE! Tickets for the Brighton Fringe went on sale at 10am on Wednesday 27th February. You can book for 'Laurel and Hardy' HERE and for 'Jack the Ripper: Facts, No Fiction' HERE. THIRD REHEARSAL DONE AND WE HAVE A NEW ROUTINE! Having just had our third rehearsal, we've managed to block the entire Brighton version of the show and we're beginning to put together the slapstick sequences. Here's one of them below. 'AT THE BALL, THAT'S ALL' DANCE - READY AFTER ONLY TWO REHEARSALS! Far from the expected long-haul of constant rehearsal for weeks to get the closing dance right, we are thrilled to announce we've finished it after only a couple of hours work - not bad for two non-dancers! Have a look below. 'LAUREL AND HARDY' REHEARSALS NOW UNDERWAY! The first rehearsal of 'Laurel And Hardy' took place on February 17th 2013. We've got a video of the process for you below. We're delighted we managed to block twice the amount we expected... and that includes most of the dance! Tony and Philip recently acted in a short psychological film called 'Halves', directed by Jonny Dry and filmed in a very cold barn in Wood Street. Here's a screenshot from the rehearsal day in early February. Lucky Dog is delighted to welcome Kelsey Williams, who will be our pianist and deliver the occasional line during our residency in Brighton. Tony and Philip recently played Stan and Ollie (and had a great deal of fun) in a dark comedy directed by Chip Thompson and filmed in Folkestone, Kent. You can see some screen shots from the film below. Lucky Dog will shortly be making two video clips to be used in the Brighton run of 'Laurel and Hardy' recreating scenes from 'A Chump at Oxford' and 'Way Out West'. The boys will be assisted by the acting talents of Jon Cotterill. If you want to see the original clips they'll be recreating for the show, have a look at the two YouTube links below.